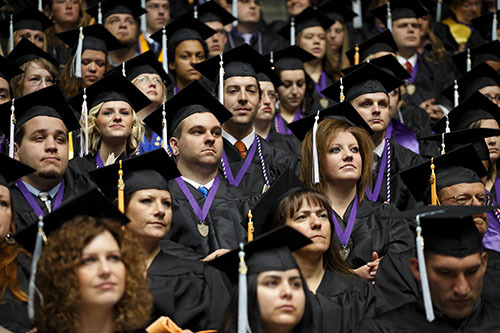 OGDEN, Utah – Weber State University officials expect the class of 2018-19 to total more than 5,988 graduates. So far, 3,160 students have applied for spring graduation and will be honored April 26 at the 153rd commencement at 8 a.m. in the Dee Events Center. Individual college convocations will be held at various times throughout the day at four campus locations: Dee Events Center, Val A. Browning Center Austad Auditorium, Shepherd Union Wildcat Theater and Shepherd Union Ballrooms. The times and locations of the college convocations are listed at weber.edu/commencement. Graduates may pick up their free cap, gown and tassel at Grad Finale, April 16 from 8 a.m.-4 p.m. in Shepherd Union Ballrooms A and B. All graduates attending commencement will receive a pewter die cast medallion with the presidential seal in honor of their achievement. The commencement speaker is Weber State alumna Jeanne Hall ’69. Hall spent nearly 20 years as a counselor for the Ogden School District. She is the co-chair of the Alan & Jeanne Hall Foundation, a family-run nonprofit organization with the objective to improve the lives of low-income families by helping them become self-sufficient. Hall has received numerous awards for her philanthropic efforts in the Ogden community. This year’s student speaker, Austin Nelsen, is a history major who was recognized by the College of Social & Behavioral Sciences as the Most Outstanding Student Researcher and for writing the Best History Thesis of 2019. Nelson plans to pursue a Ph.D. in history following graduation. The 2019 Brady Presidential Distinguished Professors also will be recognized at the ceremony. This year’s recipients are Leah Murray, political science and philosophy professor and Shi-Hwa Wang, performing arts professor and director of strings studies. A luncheon will be held from 11 a.m.-2 p.m. in the Shepherd Union Building Atrium. Each graduate will receive three complimentary tickets to the luncheon when they pick up their caps and gowns at Grad Finale. Students who are unable to pick up their complimentary tickets at Grad Finale may get them at the Shepherd Union Information Desk from April 18-26. Additional lunch tickets may be purchased at Grad Finale or at the Information Desk for $11 each. The Putting Students Through ceremony, a short program where graduates honor parents, spouses or friends who supported them, will be held April 25 in the Shepherd Union Ballroom at 4 p.m.
Campus parking is open to the public free of charge the day of commencement. Shuttle bus service will pick up passengers at the W8 parking lot, south of the Browning Center and Kimball Visual Arts Center, and transport them to the east entrance of the Dee Events Center. Guest tickets are not required. Seating is available on a first-come, first-served basis. Those who have questions about accommodations for disabilities should contact Becky Thompson at rthompson1@weber.edu. Those who are unable to attend but wish to view commencement can watch a live webcast on the commencement website. To view this story online, visit this link.